If you are on social media at all chances are you’ve seen photos floating around of the Starbuck’s secret menu “Pink Drink.” I’ve been drooling over them for days. 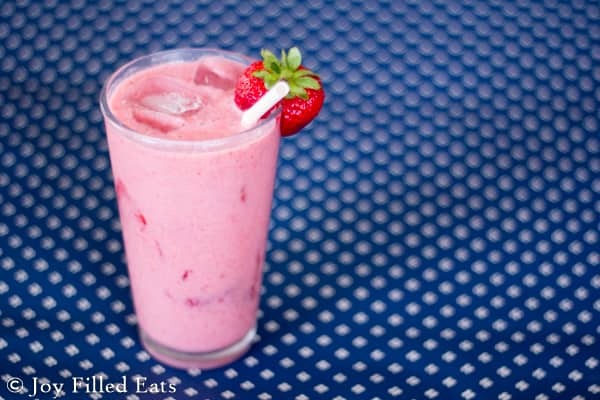 It is a Strawberry Acai Refresher combined with coconut milk and chunks of fresh strawberries. 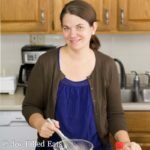 It is not sugar-free or low carb. The Refreshers have sugar and so does the coconut milk Starbucks uses. Bummer. 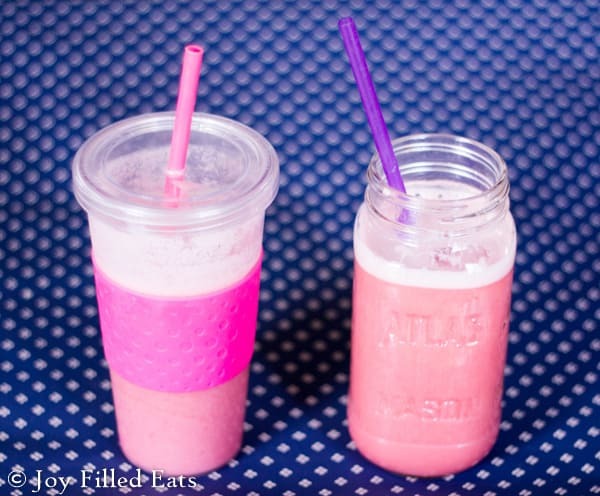 So I made up my own copycat Starbucks Pink Drink Recipe! Disclaimer: I have not had an official (or unofficial) Starbucks Pink Drink since it is full of sugar. I just went with the strawberry coconut combination and played around. I really love the results. My first attempt looked a lot thicker than the Starbucks photos. So I went back to the kitchen to make a Starbucks pink drink recipe that was more drink than a smoothie. 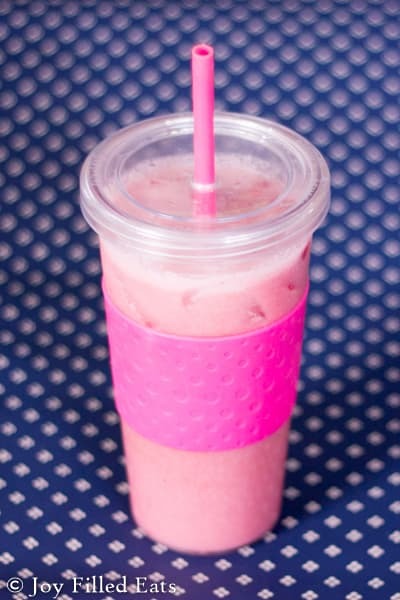 Then I was thinking how nice this would be as a sipper for the Trim Healthy Mama diet so I made one more variety. The 1 1/2 tbsp offull-fatt coconut milk has 5 grams of fat which keeps it in Fuel Pull territory. 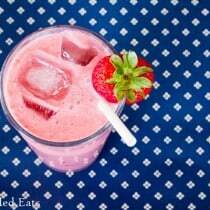 This Starbucks Pink Drink Recipe is refreshing with strawberries and coconut! Drink Directions: In a large glass measuring cup pour boiling water over the tea bags and steep for 5 minutes. Add the sweetener and stir to dissolve. Add 1 1/2 cups ice water. Stir to melt the ice. Blend this with the coconut milk and strawberries. Blend in the xanthan gum. Pour over additional ice and strawberry chunks. Smoothie Directions: In a glass measuring cup pour boiling water over the tea bags and steep for 5 minutes. Add the sweetener and stir to dissolve. Add ice to make this equal 1 cup. Stir to melt the ice. 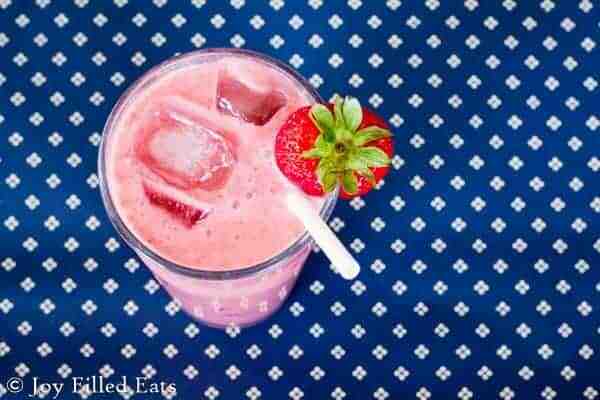 Blend this with the coconut milk and strawberries. Blend in the xanthan gum.Pour over additional ice and strawberry chunks. Sipper Directions: In a glass measuring cup pour boiling water over the tea bags and steep for 5 minutes. Add the sweetener and stir to dissolve. Add ice and cold water. Stir to melt the ice. Blend this with the coconut milk and strawberries. Blend in the xanthan gum. Pour over additional ice. Wow, this looks soooo pretty and perfect for summers. I'm going to try them soon. What a great idea to combine those tea flavors. They're some of my favorites. Yum. When you say coconut milk, do you mean canned? Or in a container like cashew milk? Just curious the carb amount for this? Thanks! sound yummy, but what categories do these fall in?? For THM? They are an S because of the coconut milk.